It was so mild and springy here in the NYC today, it was almost disturbing, but it definitely put me into "spring makeup swatching" mood. I found this campaign image from Cargo FB page. Isn't she gorgeous? 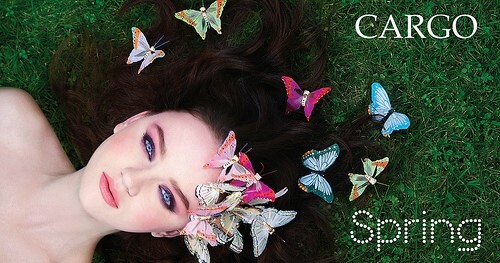 I love the whole look with fresh colorings and butterflies! The set consists of the soft neutral colors with healthy glow that would flatter most skin tones. This blush creates gorgeous shimmery coral glow. It is a perfect combination of blush and bronzer, in my opinion. Cargo Blush packaging is just great for swirling and tapping the colors into the perfect mixture. The light pink color is one of the prettiest I've seen. It is fabulous to brighten the inner corners of my eyes. The texture and the color payoffs are excellent. It is one of the few non-waterproof mascaras that holds my curls. No, thank you. I just got back from hunting. Obviously, the only unnatural part of this look is the vampy color contacts. I am especially in love with the blush color and pleasantly surprised by the mascara. This collection would be perfect for naturally feminine look. I gotta tell you though I always feel natural looks take more time and effort to achieve! Have you tried these colors? I am loving the blush. When you said it could be a blush + bronzer, lightbulb lit up in my head. I'm kind of lazy, less product to use and still get both is perfect for me. Another trip back to Sephora. Good that I am only in the city for this week. Would be broke if I keep popping back to the store. oooh that lipgloss is calling my name, Pink and brown are always so perfect for spring. Aw I hate it when I drop powder products!I understand your pain. Good thing it didn't shatter too much. The blush looks so lovely on you. The promo pic is really pretty, though I really like how you used the products for a more every day look. I am a sucker for blushes! and I've been wanting to try cargo blushes, I can order them online, but my self control is still strong! lol. btw so sad that u dropped the blush, T.T but it's good that the blush didn't shatter into powder. usually people consider warmer tones as safe colours..but you are like me in this regard..and the colours do look awesome..i think i need to get me one of those blush/bronzer thingys...and the contacts are so cool! i am glad to hear that you think these colors work for me. i am a bronzer dummy and don't even know where to start, so this is just perfect for me. coral beach would look gorgeous on you. there are so many beach blushes from Cargo, i myself am trying not to look at them! (*sobs*) thanks for understanding, Eva! the lipgloss color reminds me of NARS turkish delight a bit! i remember your cable beach post, Sunny! i was not into striped products at all, but i can' deny this is a superb blush. i thought the same thing. "at least the girl didn't have to fret around the real butterflies!" i am not embracing the idea of applying blush AND bronzer, so this is perfect for me. The lenses looks soo good on you! great colors.. i love the blush when it all blended..
i am sure pink and even red contacts got popular after the twilight saga. i am happy that at least one warm colored blush works for me! the eyeshadow colors and blushes are beautiful!!! Love the colour of those eyeshadows!!! Love how soft and fem the colors are! the colours are lovely on you! very suited for springtime makeup :) and haha love your contacts. Need a pair of pink circle lenses, they're so unique-looking and pretty! The blush color looks great on you, very natural, and I think you look great with warm tones. actually your review on VIVITE system helped me a lot to make my purchase. hope everything goes well with you move.